We have some good news for you iPhone users who didn&apos;t jump ship to Verizon. 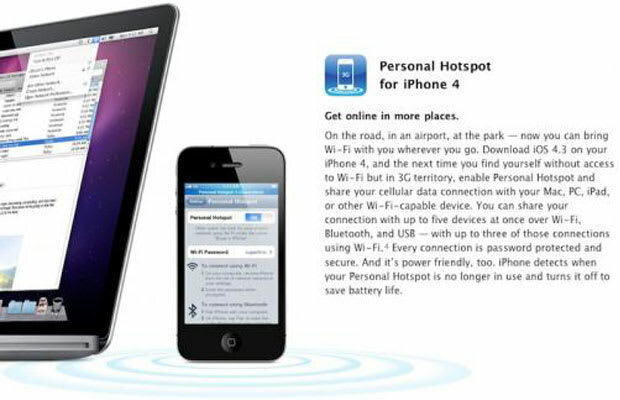 AT&T has confirmed to Electronista that it will support personal hotspot functionality when the upcoming iOS 4.3 software goes live. The hotspot functionality will require that users have the $25/month Data Pro plan plus the $20/month tethering plan that AT&T offers with an extra 2 GB of data. The personal hotspot feature will let costumers use their phone as a mobile modem for their laptops when there is not wireless Internet available. Verizon already offers a similar service to its iPhone users for $5 more. Mac Rumors previously reported that iPhone users who had access to the i OS 4.3 beta found that they were able to use the hotspot functionality with their tethering plans, but since AT&T was mum on whether or not it would officially support it, no one knew whether other customers would be able to use the service.